21 February 2017. A U.S. patent was issued today for synthetic peptides that support gene therapies developed to treat type 2 diabetes and heart failure. The patent for analogs of peptides encoded by urocortin-2 genes was issued by U.S. Patent and Trademark Office to inventors with the Research Development Foundation, which gives an exclusive license to Renova Therapeutics to commercialize the technology. Renova Therapeutics in San Diego is a biotechnology enterprise developing treatments for type 2 diabetes, a chronic disorder where the pancreas does not create enough insulin to process the sugar glucose to flow into the blood stream and cells for energy in the body. 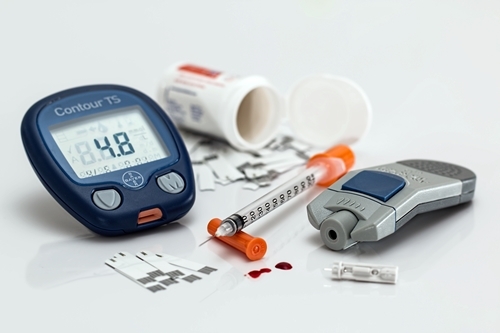 In type 2 diabetes, which accounts for some 90 percent of all diabetes cases, the pancreas produces some but not enough insulin, or the body cannot process insulin. According to the International Diabetes Federation, diabetes affects 415 million people worldwide, of which 44 million are in North America. Renova’s approach is different than most treatments that relieve symptoms, which in this case introduces therapeutic genes that instruct cells in the body to work more normally, in order to reverse the physiological effects of the disease. The treatments, called paracrine gene therapies, transfer healthy urocortin-2 genes to the liver of individuals with adeno-associated viruses, benign and naturally occurring microbes that can infect cells, but do not integrate with the cell’s genome or cause disease, other than at most mild reactions in humans. Renova is developing paracrine gene therapies for congestive heart failure as well as diabetes. The technology was developed by University of California in San Diego medical professor Kirk Hammond, a co-founder of Renova. Hammond also serves on Renova’s board of directors. In a study published in September 2016, Hammond and colleagues tested the treatments in lab mice induced with insulin resistance, a precursor condition for diabetes, which received healthy urocortin-2 genes via adeno-associated viruses. The results show mice receiving one dose of the healthy genes increased their insulin sensitivity and glucose disposal, with normal blood glucose levels returning within weeks. In addition, their normal glucose levels persisted for the 3 month duration of the study. Urocortin-2 genes encode peptides, short chains of amino acids that in this case improve the uptake of glucose in the body and improve coronary blood flow. In their natural state, however, urocortin-2 peptides are not water soluble, making them difficult to administer as medications. The patent covers synthetic water-soluble urocortin-2 peptides, as well as their use in medications. The patent also covers nucleic acids, such as those in genetic materials encoding the peptides, and vectors or their delivery mechanisms. Research Development Foundation that holds the patent is a not-for-profit organization in Carson City, Nevada that performs technology transfer functions for the Clayton Foundation for Research, located in Houston. The Clayton Foundation, also a not-for-profit group, conducts medical research with Houston institutions including Baylor College Of Medicine, M. D. Anderson Cancer Center, University Of Texas Medical Branch, and University Of Texas Health Science Center.